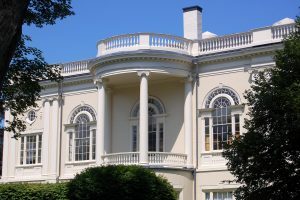 The Peabody Institute Library of Danvers is housed in a Georgian Revival building originally dedicated in 1892. In 1980, the Library added 12,000 square feet which now features a Children's Room and Archival Center. The Library staff along with a nine-member board of trustees and with the support of the Friends of the Library and the George Peabody Society works to provide a variety of comprehensive programs and services to our community. The Library houses over 150,000 holdings and has over 18,000 registered patrons. In fiscal year 2016, 11,514 patrons attended 298 cultural and educational programs at the Library including, author talks, musical and theatrical performances and educational programs. The Library Trustees are: Julie Curtis, Wilbur Cobb, Frank Herschede, Reni Conte, Richard Bettencourt, Charles Desmond, Natalie Luca Fiore, and Gail Tyrrell.